Black people were marching all over the South. Dr. King was leading people to freedom, and here I was, in the 23rd century, fourth in command of the Enterprise. Star Trek first aired during the height of the Civil Rights Movement, between the time when Congress passed the Voting Rights Act of 1965 and the Supreme Court declared prohibiting interracial marriage unconstitutional in Loving v. Virginia. Nichelle Nichols, the actress who played Lieutenant Uhura, television’s first major Black female character who wasn’t a maid, did not at first feel the full weight of her role’s significance until after the first season was finished and she handed her resignation to Gene Roddenberry, the show’s creator. In a 2011 conversation with astrophysicist Neil deGrasse Tyson, Nichols told the incredible story of how one particular fanboy convinced her to stay after all. She gave notice on a Friday, and attended an NAACP fundraiser in Beverly Hills the next day. At the event, someone approached her, saying he had a fan waiting to speak to her. When I turned around, I was looking into the face of Dr. Martin Luther King, walking toward me with a brilliant smile on his face. “You cannot leave, do you understand? It has been heavenly ordained. This is God’s gift and onus on you. This is a non-stereotypical role. This is not a Black role, this is not a female role. It can be filled by a woman of any color, a man of any color, even another alien. This is a unique role in a unique point in time that breathes the life of what we are watching for: equality. Dr. King not only outed himself as one of the founding Nerds of Color then, he helped Nichols fully realize how much larger this role was than a springboard for her to get a gig on Broadway. The mere existence of a high-ranking African woman on the Enterprise symbolized a future where all the ideals the civil rights activists marched, fought, and died for had come true. The following Monday, Nichols again talked to Gene Roddenberry and asked for her job back. After hearing about her encounter with Dr. King, Roddenberry handed back her resignation letter, already torn into little pieces, and they went on to further go where no show had gone before. Nichols could have stopped there, but she did not. After her stint on the Enterprise finally came to an end, she became an active volunteer for NASA, recruiting minority and female space personnel. The astronauts she brought to the agency include Dr. Sally Ride, the first American female astronaut, Colonel Guion Bluford, the first African American astronaut, and Dr. Mae Jemison, the first African American female astronaut. And with just one picture, Nichols won Barack Obama the crucial nerd voter demographic. 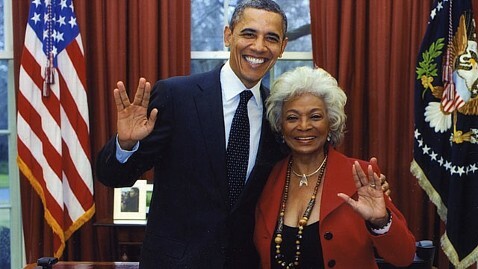 Nichelle Nichols is more than a pretty face; she is a trailblazer and tireless nerd advocate. You can keep up with the latest Nichelle Nichols news on Twitter @RealNichelle.